It’s such an honor to be recognized ~ especially when the recognition is based upon awesome creative and rock-solid, proven results. From exhibits to events to environments and pretty much everything in between, 2020 Exhibits has the in-house resources, expertise, creative moxie and muscle to design and deliver across the full spectrum of event and tradeshow marketing. 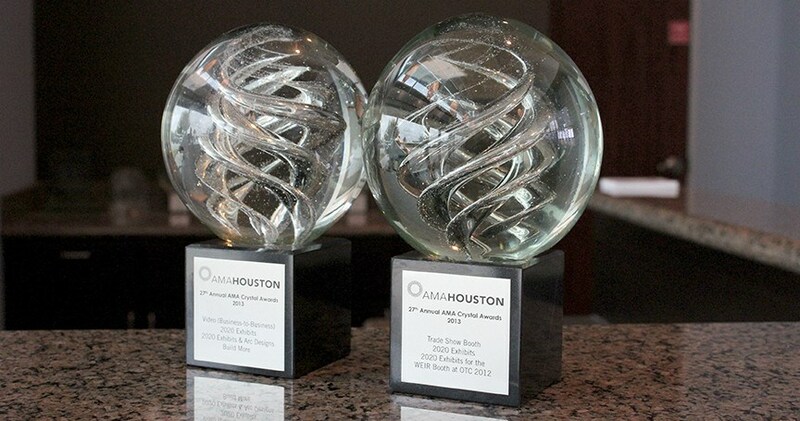 We are pleased and proud to share that two of our recent projects were celebrated at the 2013 American Marketing Association Crystal Awards where they earned top spot – the coveted Crystal Award. In the B2B Video Category, the innovative and forward thinking ARC Designs, Inc., challenged our design team to tell their story –in a clear, concise, compelling and captivating way. With a rich and proven history in quality fabrication and building manufacturing, ARC Designs sought to deliver a polish, professional image which would stand up against larger, more recognizable big corporate competitors. Through the use of creative video and animation, ARC Designs comes to live. Clients and prospects could see their solid, extensive capabilities in action. And in a sea of exhibitors, ARC Designs more than made a mark. Leads garnered at the show are credited for driving a 30% increase in new projects as are two new partner relationships, which has meant an uptick in referrals and new opportunities. ARC attributes this success to their overall presence and dynamic visual presentation. In the Trade Show Exhibit category, 2020 Exhibits and the remarkable WEIR Oil & Gas netted a Crystal Award for the OTC2012 exhibit. From the unveiling of one of their newest pumps, DESTINY, to demonstrating their turn key, robust products and services, WEIR sought to deliver a strong impression – showcasing their brand message “WEIR IN ACTION” and make their presence known in a sea of more than 2,500 exhibitors. The 2020 Exhibits Design Team sought to incorporate distinctive brand elements throughout – from the large screen video wall showcasing the WEIR story, to the brightly colored and branded banners to the overarching triangular hanging signs heralding WEIR IN ACTION, stretched from multiple angles and demanding attention across the show floor, the WEIR exhibit ruled the day.